And here is the only and true form of Art. Once preconceptions that are without any foundation and prejudices that are wholly illogical have been eliminated, the field is clear for the imagination of painters, for the aesthetics of appearances that are beautiful. Neo-traditionalism cannot waste its time on learned and feverish psychologies, literary sentimentality requiring an explanation of the subject matter, all those things which have nothing to do with its own emotional domain. It has reached the stage at which definitive syntheses are possible. Everything is contained within the beauty of the work. How unhappy those who wore themselves out with their brains enslaved, seeking originality, new subjects, new visions! Repudiating their own best feelings because they had become used to denying beauty, because they interposed their care for trompe-l’oeil between their emotion and the work! What is it that differentiates modern painters amongst themselves? It is often (as I explained above) their way of seeing, more often it is procedure, and still more often the subject. Such identical imaginations! They all follow the same fashion. And if one should undertake to reveal a new fantasy - instead of modifying, oh, by very little, as might be suitable, the lighting or modelling of the previous one - what a scandal! Only just recall the Femme jaune of Besnard (26). (26) Paul-Albert Besnard (1849 - 1934). Painter using a vaguely Impressionist-influenced style for misty and sentimental portraits of women. Decorated the ceiling of the Petit Palais in Paris. Art is the sanctification of nature, of that nature which throughout whole world is content just to live its own life! The great art, called decorative, of the Hindus, the Assyrians, the Egyptians, the Greeks, the art of the Middle Ages and of the Renaissance, and those works of modern art that are decidedly superior, what are they but the transformation of common sensations - natural objects - into sacred icons, hermetic, imposing. The hieratic simplicity of Buddhas? Monks transformed by the sound aesthetic judgment of a religious race. Again, compare the lion in nature to those lions of Khorsabad; which of them would compel us to go down on our knees? The Doryphore, the Diadumenos of Achilles, the Venus de Milo, the Nike of Samothrace, those are in truth the redemption of the human form. Is it necessary to mention the Saints - male and female - of the Middle Ages? Do we have to mention Michelangelo’s Prophets and Da Vinci’s women? I have seen the Italian Pignatelli (27) from whom Rodin drew his John the Baptist - the quite ordinary model has become the appearance of the Voice that marches on, the venerable bronze. And the man whom Puvis immortalised as the poor fisherman, eternally downcast, who was he? The universal triumph of the imagination of aesthetes over the efforts of unthinking imitation, the triumph of the emotion of the beautiful over the naturalist lie. Have you noticed what the portrait gains from these experiments with "high tapestry?" (28) There is one painter with a beautiful imagination, despite his general timidity, who dreams with one and the same dream both pastels of a musical fantasy, and portraits. Do you not love, amid the tumult of a Salon, to lose yourself yourself in front of a Fantin Latour? (28) 'In the 1890 manifesto of painting Définition du néo-traditionnisme, Maurice Denis compared those paintings he held in high esteem with "haute tapisserie" ... 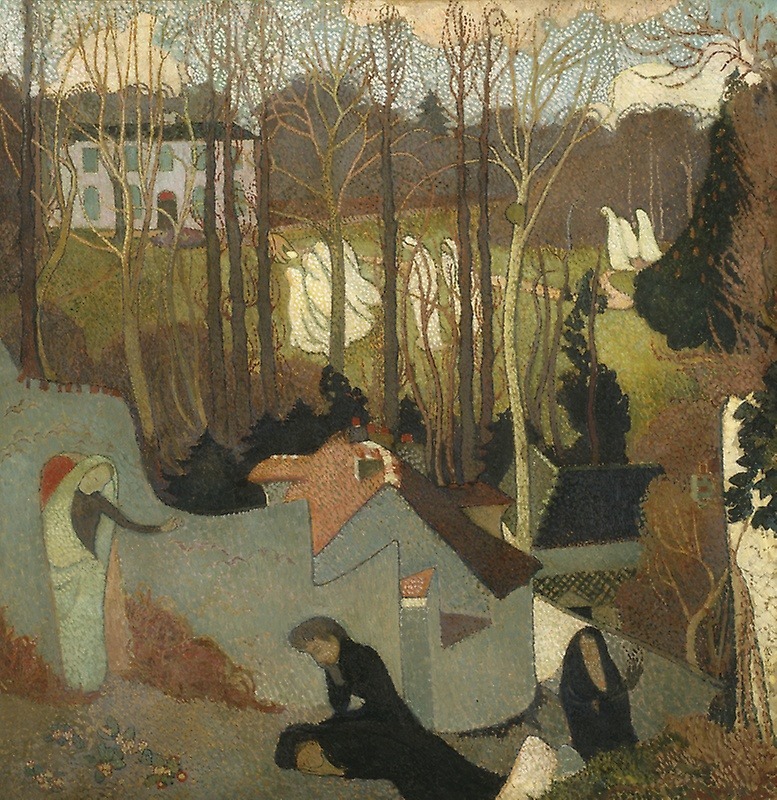 In 1894, the Nabi Edouard Vuillard noted in his journal how around 1890, Denis and Sérusier had taught their fellow artists that a painting should simply be a blow-up of a tapestry fragment ... the formal aspect of this model function, concerning the juxtaposition of colours and short, interrupted brushstrokes in a two-dimensional field' - Merel van Tilburg (2014) 'The Figure in/on the Carpet: Félix Vallotton and Decorative Narrativity', Konsthistorisk tidskrift/Journal of Art History, 83:3, 211-227 (https://www.tandfonline.com/doi/pdf/10.1080/00233609.2014.933250) The formula 'blow-up of a tapestry fragment' seems to me a little improbable. (29) I'm guessing that he still has the 'timid' Fantin-Latour in mind. In referring to 'decadents' he is probably thinking of the poets behind the 'little journals' of 1885-6, La Décadence and Le Décadent. I see La Gioconda once again; oh, the sensuous delight of that happiest of conventions which dispels life, the false and irritating life of a wax figure that the others are trying to achieve! And the light! And the air! Blue arabesques, in the background, the rich accompaniment of a conquering, caressing, rhythm, to the main, orange-tinted, theme, like the seduction of violins in the overture to Tannhäuser!